As I checked in and received my tickets, I said good bye to my father and made my way to the gate. I met up with the students from UNT and could see that everyone was excited. We all were a little stressed from all the last minute packing. It all hit us as the airport clerks called out the group numbers for boarding, we were now going to Chile and embarking on this special opportunity. For some it would be their fourth or fifth time out of the country, for others it would be their first. However, I knew that this trip would be very meaningful and much could be learned from such a unique endeavor. We took off around 9:00 pm and got comfortable for our sleep – or for some, for our late night catch-up on course readings. On the plane ride, I had some time to reflect on why I came on the trip. To myself, I knew that I was interested in biological and cultural conservation and understood the relationship between the land and people; however, I never was aware of any program that existed to preserve both aspects until several months before. I wanted to come on this trip to learn more about this idea and meet the people that strive for it. I also came to get away from “modern” life and immerse myself in nature in a very raw and open way. The degree of connection that I was going to feel was something not expected. The plane flew seamlessly into the dark night, headed for Santiago, Chile. After several stops, one in Santiago and one in Puerto Montt, we finally arrived in Punta Arenas and were accompanied to the Hain Hotel. Everyone was tired from all the flying, but a ceremonial dinner was planned, and we had one hour to get ready for it. The dinner was tasty, and we were told class would begin the following day. None of the students really had an idea of what “class” would actually be. I myself was excited to find out what exactly we would be learning. Over the course of the next few days, some of the experiences we shared included penguin watching, visiting the cemetery near downtown Punta Arenas, sampling various points of Las Minas for stream visual assessing, and hiking up to a waterfall in the Magallanes Forest Reserve. Hiking to the top of the Magallanes Reserve was a very deep experience for me. I hiked up slowly and began to take notice of all the things around. As I observed the abundance of flora around myself, I began to feel drawn to all that was around me. As a biology student, I could not help but marvel at the complexity and intricateness of the plants as they clung onto the sides of the steep slopes. But this wonder then permeated not only the plants, but then to the water around it, the rocks below it, the sun above it. I thought back to my studies and how I learned from a biology book on how the sun provides energy for the plants and how the water provides nutrients for the plants. I also learned how plants respire oxygen and how humans, like myself, breath in this oxygen for metabolic processes. But this was different, I was breathing in this oxygen. And in a sense, everything else was too, breathing together as one. I logically understood the connectivity of nature through my biological studies, but I believe that hike illuminated the realization of this connectivity to me through experience. The whole is indeed greater than the sum of its parts. I couldn’t help but smile; it was only day two of the trip, and we had two and half weeks left. Some of the required readings for the class dealt with this sort of experience: two that stuck out of my mind were the Zen readings and the Sea of Cortez by Steinbeck. I could not help but reread Sea of Cortez. But in this case for me, it was the river instead of the tide pool. The picture I posted is the sunset beyond the Dientes de Navarino Mountains in the Omora Park. There was much more I experienced on the trip that I would like to share, but I do not want to take up too much space on the Osara journal website. But I know there is much more to experience in Chile because I kissed the foot of the Patagon of the Magellan Statue in Punta Arenas. I am very grateful for the experience we all shared and long to see all of you friends again in the future. I arrived in the country a little over a month ago, flying from Quito to Punta Arenas, and, following a brief stint in Tierra del Fuego, have since been volunteering for Omora on Isla Navarino, in sub-antarctic Chile. I plan to be here for five or six months. My arrival in Punta Arenas coincided with Dr. Christopher Anderson’s trip to Karukinka, a wildlife reserve in Tierra del Fuego owned by the Wildlife Conservation Society, so I went along. We spent about five days tramping around in peat bogs and lenga forests and up the sides of mountains collecting water samples from streams, lakes, and beaver ponds in order to evaluate the impact of invasive beavers on aquatic invertebrate diversity. Being late spring in southern Chile, the weather was wildly erratic, featuring hail, snow, wind, rain, and brilliant sunshine, not infrequently all in the same day. Beavers were introduced into Tierra del Fuego for the fur trade in the 1940s, and have spent the intervening years generally wreaking havoc on the native forests. Their dams flood the surrounding area, drowning the roots of the trees, over time creating a patch of waterlogged ground and still standing, dead, decaying snags. These patches, scattered over the landscape, are clearly visible from the air. I flew to Puerto Williams, my home for the next several months, on the 7th of November, riding in a tiny little plane over what I have heard are breathtaking views of Patagonia, the mountains, glaciers, etc. We, however, were enshrouded in a clouds almost the entire flight, so these allegedly majestic vistas remain to me a subject of myth. Puerto Williams is very, very small, a town of about 2,500 people on Isla Navarino, just across the Beagle Channel from Argentina. Easily more than half of the inhabitants are families with the Chilean Armada, only posted here for a few years, so the actual, permanent population is smaller yet. A group of three bryologists arrived a couple days after I did to work on Tayloria, a genera of moss in the family Splachnaceae that grows obligately on animal feces and emits unpleasant odors from its mature sporophytes in order to attract spore-dispersing flies. I spent the next several days with them and two students from the University of Magallanes looking for moss populations in the Parque Omora and in local peat bogs. There are three species of Tayloria reported on the island, of which we were only able to find two, one, T. mirabilis, which grows in the lenga-coigue forests, and the other, which grows in the sphagnum bogs. The U. Magallanes students continued working with the moss after the bryologists headed back north, both trapping the flies attracted to the moss for identification and analysis and working on a study of the moss phenology. Other than that, I’ve mostly been involved with birds. Omora spends six days every month banding birds caught in mist nets at two sites in the Parque Omora, one site in so for a week in November I left the house every morning at five with Rina, the research assistant, in order to open the nets by six. We band the birds, and then measure and weigh them before releasing them. Omora has amassed about 6,500 capture records over the last six years of regular banding. The Institute of Ecology and Biodiversity, based at the University of Chile, has a couple hundred nest boxes in and around the park in order to study rayaditos (Aphrastura spinicauda). I worked for a couple days with two researchers from Santiago, banding and taking blood from the nestlings and parents, and running exploration and predation experiments with the adult birds. 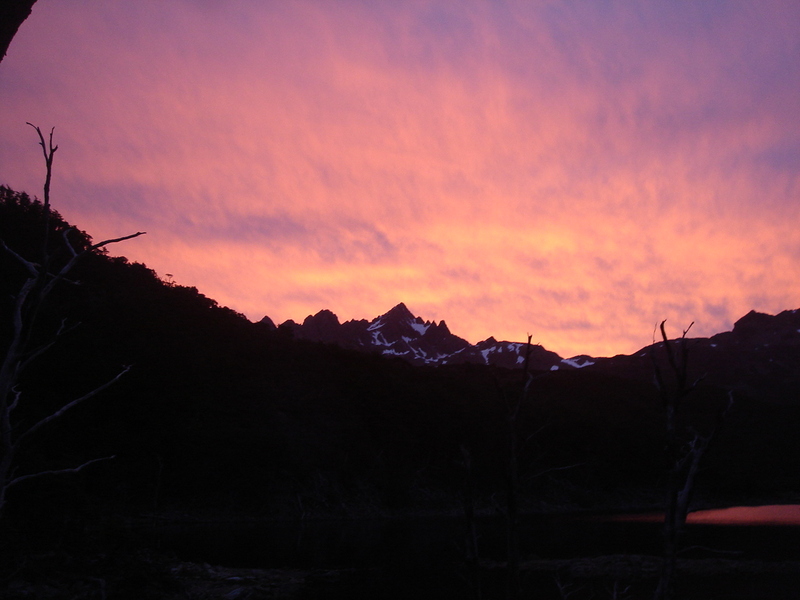 The data can be compared with similar data collected in Chiloe and Tierra del Fuego, in order to evaluate latitudinal differences in nesting behavior. I’ve also spent a fair amount of time with Elke Schuttler, a PhD student studying the impact of invasive mink, a very recent arrival to the island, on ground nesting birds. She locates and monitors the nests of several species of coastal birds, as well as placing artificial nests, in order to observe predation and the impacts of that predation on native birds. We put out 150 artificial nests early last week, at six sites, and five days later ninety percent of them had been predated. The sites on rocky coasts seemed to have a much higher rate of predation by mink rather than native birds of prey such as caracaras. This is possibly significant considering that the number of kelp geese (Chloephaga hybrida), a species which nests obligately on rocky coasts, seems to be decreasing. I have great news. We went fishing this past weekend to Lago Pollollo with Rigo and encountered another species, Aplochiton zebra (in Wulaia we found A. tenatius). If you need info on these fish try fishbase.org. That’s really exciting because they seemed to be living happily with the trout which Bob McDowell (osmeriform expert) didn’t expect. Also, puye seem to be a plenty on the island. So I don’t think you have to worry to much about the trout – but there were definitely more puye on Hoste (2500 in one reach of 100 m long and 3 m wide – I’m serious on that one.) We did a site at Puerto Inutil – no fish, but we did see some puye in the coast and the fishermen caught some robalo with gill nets while we were working, Wulaia – only puye and A. tenatius, Douglas (2 sites) – puye, rainbow and brown trout, 2 sites on Murray Channel – one had no fish and one had puye and small browns and 3 sites at Kanasaca – one had 2500 puye, and the other two had less puye and brown trout. By the way, the puye do seem to like beavers – the sites with the most puye have a beaver pond just upstream. So there’s lots interesting going on. We’ve done about 22 sites and have 3 left – if the weather is good. Oh one more interesting thing – we went upstream of the dam at Robalo today – no fish – we sampled both sites. Probably due to the dam. I hope all is well in the United States. I have just gotten back for an awesome trip collecting fish in the Murray Channel and on Isla Hoste. I have attached some photos, but don’t worry I have tons more. At one site, we came across a different species (I’ve attached a photo for the fish nerds) which was very exciting and at another sites we caught over 2500 galaxiids in 100 meters of river – the native fish – and the river was less then 2 meters wide. We were counting fish until 12:00 at night. We also had an asado one night with various fishing boats – which was a wild experience – cooking the freshly killed lamb over the fire and then devouring it with our hands afterwards. And one of the fishermen happened to be the cousin of another scientists I have worked with here in Omora. How strange to be at the end of the world – at an estancia in the middle of nowhere and run into another person who knows one of the 15 people I know in Chile – raro! (Although they probably thought it was strange there is a gringo in the middle of nowhere shocking fish in rivers). Well I hope everyone has a good week. I hope all is well in the Northern Hemisphere. We’ve been working hard down here on the other end of the world and catching lots of fish. I’ve attached some pictures so you can see me at work (and at play – I went on a great hike the other day). Friday I leave for a week to go sample the western and southern part of Isla Navarino and Isla Hoste – I am really excited to go back to the glaciers another time. If the weather keeps up, it will be an incredible trip. So four of us (myself, Paul (my helper) and two fishermen (Ricardo and one yet to be named) will pile into a fishing boat for a week. It should be an adventure. I will definitely send pictures when I get back. Have a good week! Hello from the fin del mundo! It is really exciting to be here on Isla navarino studying fish and the relationship between the native and exotic species. We have started sampling streams on the island and we are already seeing a dichotomous distribution between the presence of the natives and the presence of exotics. It appears that the introduced trout has eradicated the presence of the native galaxiid (G. maculaus) in most streams, but there are some streams dominated by galaxiids where only a few small trout are present. This is exciting to see and I look forward to sampling many more sites to find out what environmental mechanisms are related to this distribution. I´ll keep you posted. I hope this email finds you well and in better weather. It has been cold and rainy due to a low pressure system off Cape Horn since I have arrived. Luckily the work we are doing at the moment doesn’t require nice weather (although sun always makes for a better day in the field). I heard it has been very nice in North Carolina – how funny is that. Otherwise, all is well. I knew when I was flying over the Cordillera Darwin, looking out at the majestic glaciers and mountains that I was really lucky to be back. I also had good luck in the technician I hired, he is very enthusiastic, hard working, and speaks english (a plus since my spanish is only so so). So hopefully both of our second languages will improve by the end of the month. There is a good group of scientists working here now – most are studying the introduced mink and birds- so it is wonderful because we can all learn from each others work. In fact, I have my first fish without electrofishing – my coworkers found some galaxiids swimming in a lake the other day and brought me a sample and I found mink tracks and Carpinteros (Magallenic woodpeckers) and took photos and GPS points for them. It is nice because we all help each other out. I forgot to bring photos with me on my pen drive today, but I will send a photo next week – maybe after we catch some fish. imagined it – vibrant and unique. The landscapes have augmented our endeavor in a variety of ways, ranging from beautiful snow capped mountains, to pristine virgin forests, to vast archipelagos and seemingly endless channels. We have witnessed our first full moon on this continent, which is brighter than any I have previously seen – intensely bright, as to blind the eyes, or something like that. 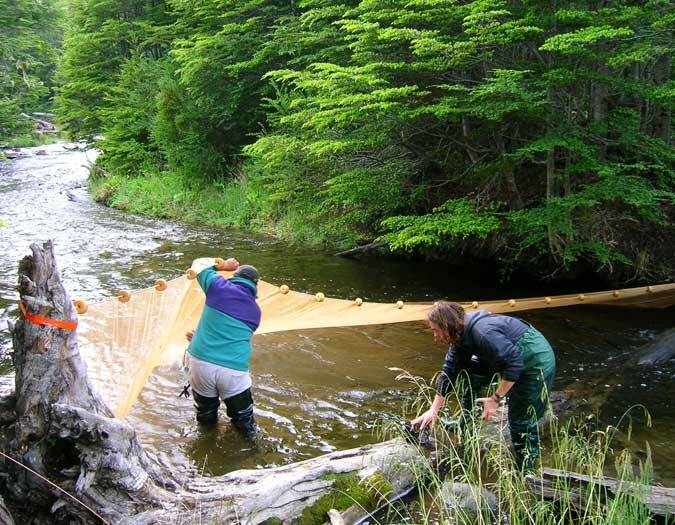 The purpose of our venture, ecological research, has been progressing agreeably. We have begun to explore much of the immediate environment, as well as initiated our field research, including Brett’s ornithological extravaganza and Amy’s macroinvertebrate cabaret. My data analysis stuff is developing nicely as well, like a fine lentil stew awaiting mastication.